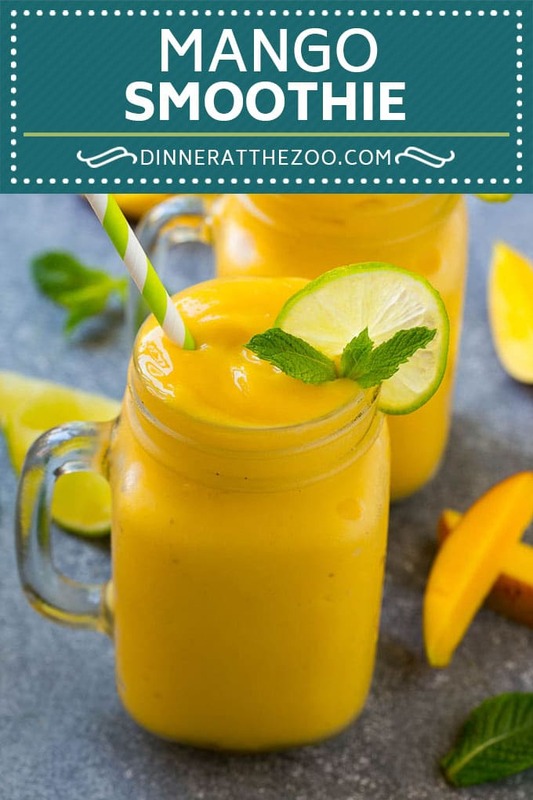 This mango smoothie is made with frozen mango, yogurt, banana and juice, all blended together into an ultra creamy drink. A super refreshing way to cool off on a warm day. 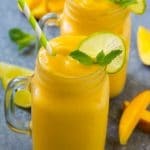 A healthy mango smoothie is just what I crave when the weather gets hot, or when I need a quick meal or snack. You can make this smoothie in just 5 minutes! 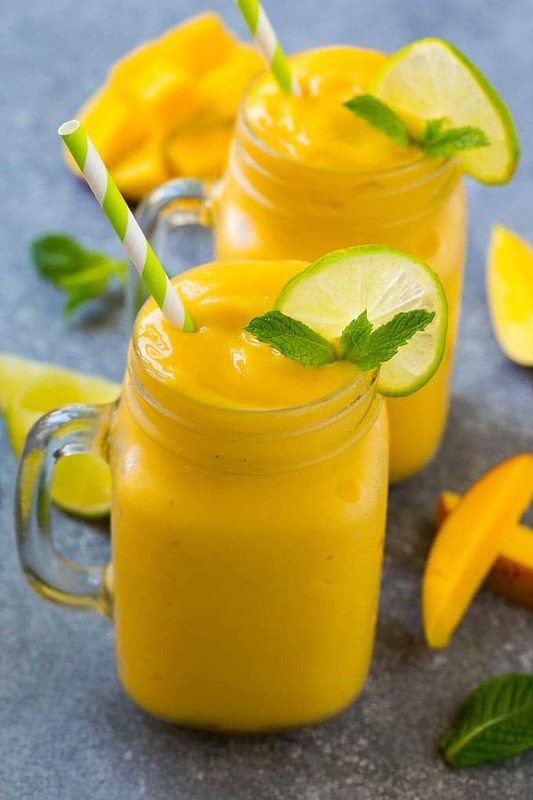 There’s nothing better than kicking back with a mango smoothie on a blazing hot day. Plus, there’s just something about mango that makes me feel like I’m in a tropical paradise. Why not use the heat to daydream a bit? If you want to make your own frozen fruit, simply dice up some mango ahead of time and keep it in the freezer. If you don’t have time to make your own, frozen mango can be bought at any grocery store. To make this creamy drink, toss your ingredients into a blender and blend until smooth. 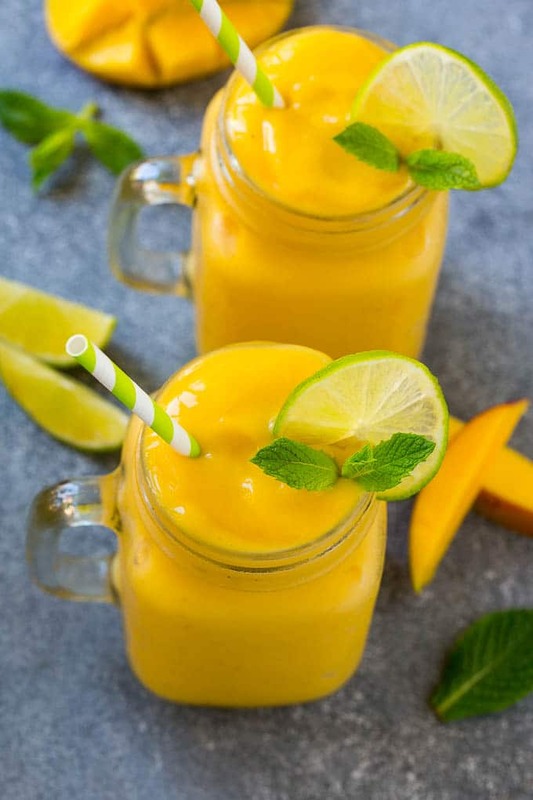 Feel free to kick back and relax once you’ve served yourself this refreshing mango smoothie. 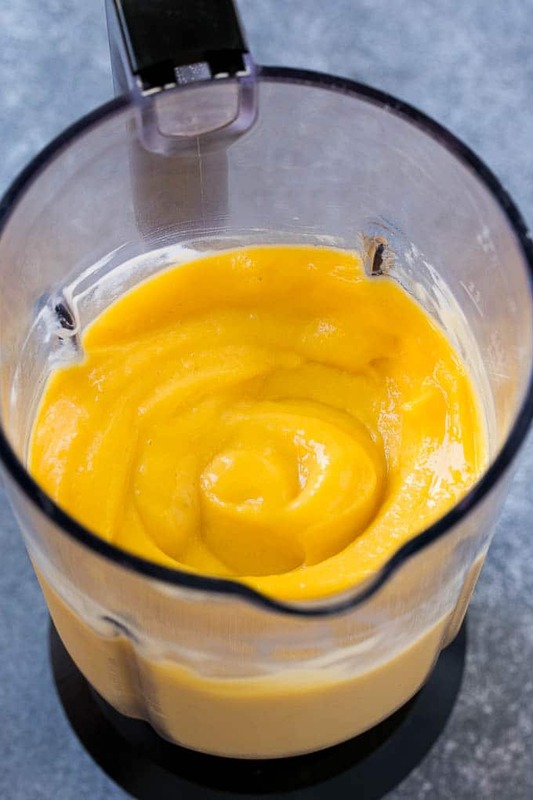 The secret ingredient to this healthy mango smoothie is mango nectar. You can find it in a can in the juice aisle at the store or in the refrigerated section in a carton. It packs a delicious flavor that makes it the perfect ingredient for your smoothie. Although this smoothie is healthy enough on its own, there are other ways you can up the health factor. One way is by using a juice that’s 100% juice with no added sugars. Another way is by making sure that your mango chunks do not contain any added sugar. WHAT ARE THE HEATH BENEFITS OF MANGO? Mango is quite a healthy fruit. Research shows that antioxidant compounds found in mango help protect against a long list of cancers. Outside of that, it helps with eye health, gut health, lowers cholesterol and more. Sounds like a fruit everyone should keep on hand! There isn’t as big of a difference as you would think. However, Greek yogurt is strained more times than regular yogurt which removes more of its liquid. This causes it to be thicker but also allows for it to contain more protein than regular yogurt. 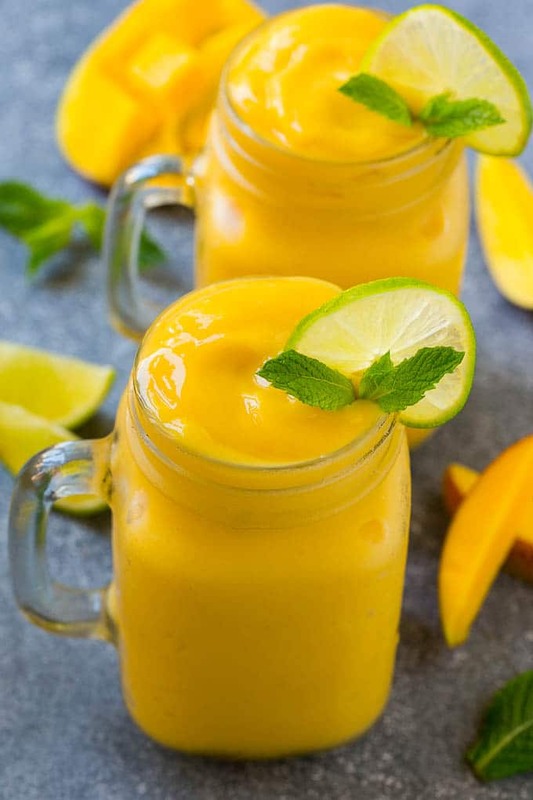 This mango smoothie will make you feel like you’re on a tropical vacation. It’s the absolute best way to cool off and get in some nutrients on a hot day! 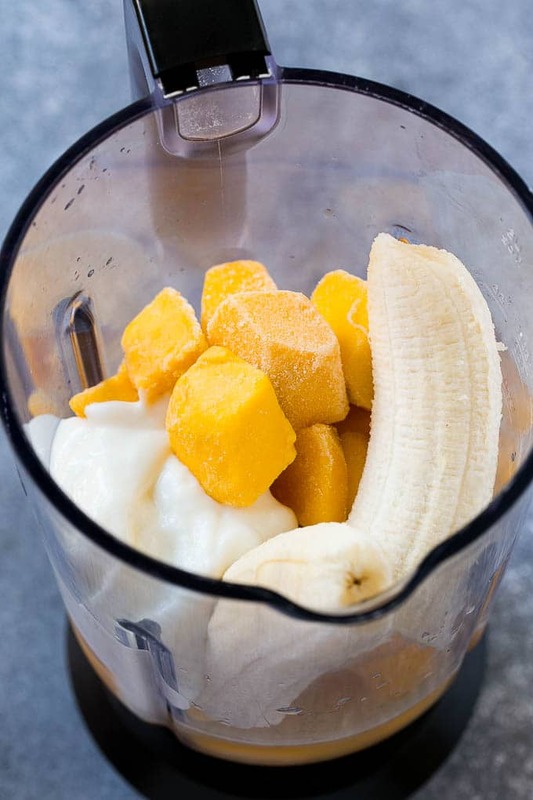 Place the mango nectar, banana, Greek yogurt and mango chunks in the blender. Pour until 2 glasses and serve, garnished with lime and mint if desired. Although Greek yogurt is high in protein, it usually does not contain vitamin D. Vitamin D is added to milk, and along with calcium, very important for bone health in addition to other essential interactions . Great for some recipes, but should not be thought of as a source for vitamin D! Thanks. I rad mango is the most popular fruit in the world! These look so yummy! I love mango juice, so i really like your recipe. My husband’s favorite fruit is mangos so I am DEFINITELY making this! So bright and summery! My family loves this smoothie! I want to drink this so bad! What a gorgeous color! Looks like the perfect treat out by the pool! I love mango in my smoothies! I have never added mango nectar. 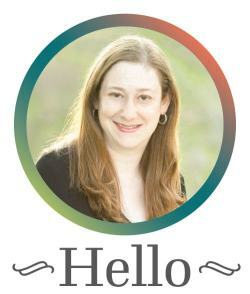 That sounds like a fabulous addition! Beautiful, delicious and wholesome, that’s a winning combination!